I’m sorry it’s taken me this long to get this up! My excuse? I got caught up in the last few episodes of the second season of House of Cards. Seriously. I’m weak, and that show is freaking addictive. My tardiness is not, however, a reflection of my enjoyment (or presumed lack thereof) of Daredevil: Road Warrior #1, which was a great read. More on that below! What struck me right away about this issue (episode?, chapter?) was how personal a portrayal of Matt Murdock it was. 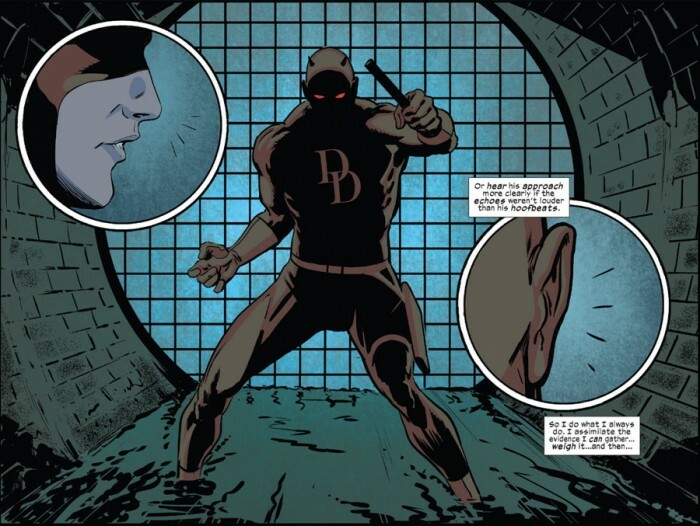 It starts off with Matt’s perspective – as he, as Daredevil, fights Man-Bull in a sewer pipe – which takes the reader through a series of layers, starting with an all black panel and graduating through various blends of radar and real world, from Matt’s view to our own. The scene is narrated by Matt who tries to find the words to explain what being him is like. The futility of the exercise is illustrated by caption boxes with the discarded ideas marked by strikethrough text. When used by teenage girls on LiveJournal, the trick can come across as annoying, but as a tool for digital comics, and particularly for this situation, it is a clever and efficient way to communicate a stream of thought. You can almost hear Matt’s voice – whatever it sounds like to you – throughout these panels, and the script and art come together perfectly to give us a very intimate understanding of who Matt is. If this were someone’s first encounter with the character, I could easily see them being immediately drawn in. Next, a new set of circumstances derail Matt and Kirsten’s journey across the country, and the story quickly spins out in a new direction that sees Matt zero in on a mysterious fellow passenger, and we are left with a juicy cliffhanger for next issue, out in a just a few days! Daredevil: Road Warrior #1 is a solid and engaging read that takes full advantage of the digital medium. The pacing is great, the story is entertaining and engaging and Mark Waid is incredibly successful in conveying Matt’s voice and personality. Peter Krause’s artwork is equally impressive, and I was particularly struck by the opening scene, as well as the exotic extreme widescreen shot of Matt’s surroundings. His is a lighter touch (for lack of a better word) than regular artists Chris Samnee’s, but the artwork balances perfectly between being representative of Krause’s unique style and the look of the main title. John Kalisz’s colors are just a tad less saturated than what we’re used to seeing from Javier Rodríguez, and they complement the overall look of the story really well. I happily recommend this story to all who consider themselves fans of the character. While the $2.99 price point might scare off hesitant digital comics newbies, what we get it a sizeable chunk of story that should entertain anyone who has enjoyed Mark Waid’s work on the book thus far, presented in an innovative way that is a perfect fit for the digital medium, thanks in great part to artist Peter Krause’s creativity and skills as a storyteller. Go get it, guys! Daredevil: Road Warrior #1 is available for purchase here. Where can I get this? I’m looking through Marvel.com and I can’t find where to buy it. I don’t own a tablet or a smartphone, so can I just read this off my laptop? @Dimetre: You’re not the first person to ask this question. I added a link at the end of the post. You can also get it on ComiXology. And you can absolutely read it on your laptop. Keep them in mind when the new Daredevil series comes out later this month. The print edition includes a digital code so that you can redeem a free digital copy at Marvel.com/redeem. If you link your Marvel.com account to Comixology you’ll have it in your Comixology library when you redeem. This is my first digital-only comic from Marvel (as opposed to e-versions of print comics) and all I can say is, for one moment… forget the story. Forget the art. Just examine the techniques used. If Marvel is doing this for all their digital comics, all I can say is that they “get” this medium in a way that DC hasn’t yet managed. And yes, I loved the story and the art and the narration too. But the technique is wowing me as hard as Waid’s writing did when I picked up DD #18. Now I’ve gotten spoiled and come to EXPECT the writing (and art) to wow me, lol. Thanks everyone. I finally managed to get it. I enjoyed it! Hopefully they timed it so this is all wrapped up by the time Daredevil #1 comes out. It actually wraps up the day before Daredevil #1 comes out (these come out on Tuesdays, remember) so the timing is well planned out! This will sound totally pretentious, but what the hell: the richness of the narration is exhilarating. In other words: this is hella good comics. I meant narrative, not narration. The artwork is as superb as the writing. Srsly, it’s the best $3 I spent all month. Will this see print? I’m old school and don’t like digital. I need a hard copy! Hopefully marvel prints this soon! This was brilliant. Waid’s experience with the digital format allows him to weave some very unique scenes of Matt and his ‘view’ of the world. Krause’s art is up to the challenge, simply terrific. Outstanding and a perfect example of how comics can expand within the digital format. As I said on another thread, I did enjoy the story, although the scenes on the plane seemed hastily drawn/inked or something. In reply to Ellen, DC does have comics like this, including Batman ’66 (based on the Adam West TV series). I finally got around to picking this up. The $2.99 price point isn’t bad. I really like Krause on art. There really is no reason at all for not trying this out. The “infinite” style of story telling on my iPad was enjoyable. I’m curious what my 13 and 11 year olds will think of this.